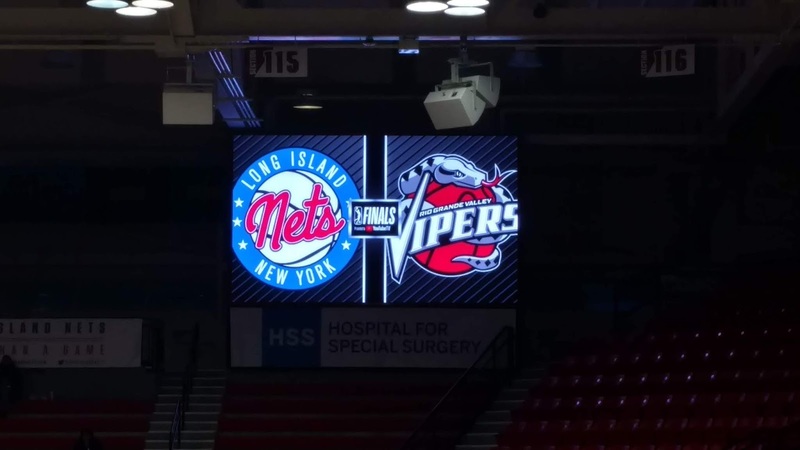 When the Long Island Nets made the NBA G League playoffs, they were able to play their first two games at their regular home, Nassau Coliseum. 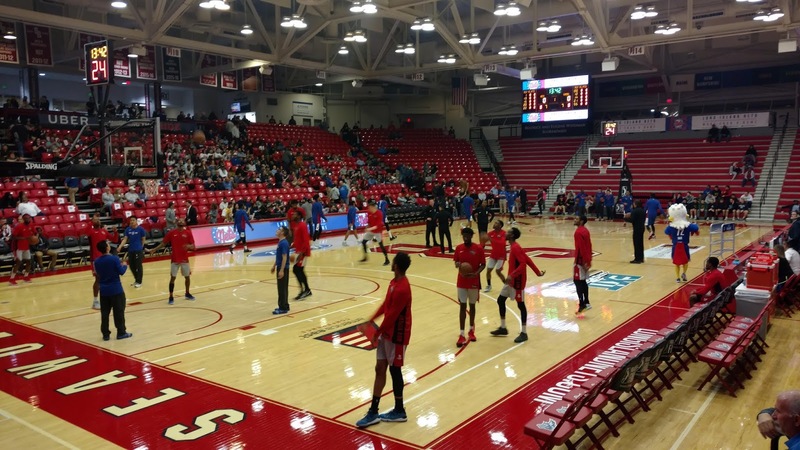 By winning both matches, they advanced to the championship against the Rio Grande Valley Vipers, affiliate of the Houston Rockets. 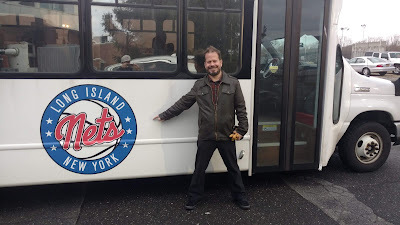 However, the New York Islanders are in the NHL playoffs and obviously take precedence at the Coliseum, forcing the Nets to find a temporary home for the best-of-three final, with Games 1 and 3 on Long Island. Up stepped the Island Federal Credit Union Arena on the campus of Stony Brook University, which arranged to host those games. 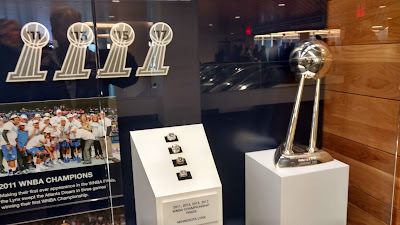 When the teams split the first two, each winning at home, the third game was necessary and as I always enjoy seeing a championship won, I headed out with my buddy Eddie Hoops. We took the Long Island Rail Road from Jamaica and enjoyed a couple of beers at The Bench, a great bar right next to Stony Brook station. After, as we walked through the parking lot, I saw the Nets team bus. 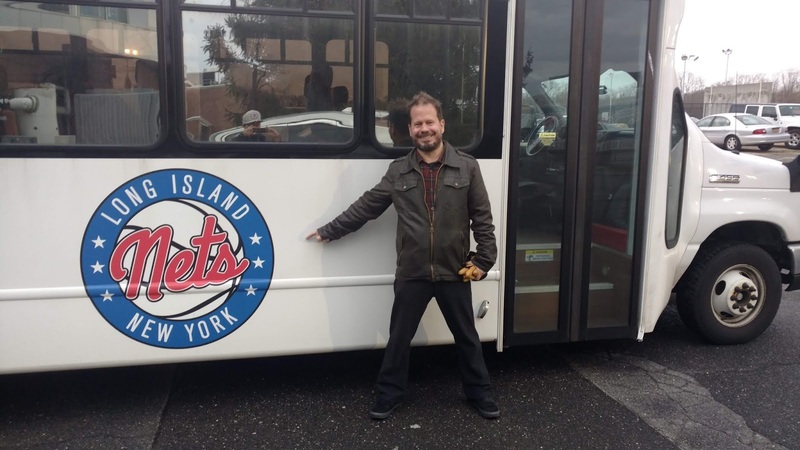 Well, probably just a shuttle for staff but still worth a rare picture of me. 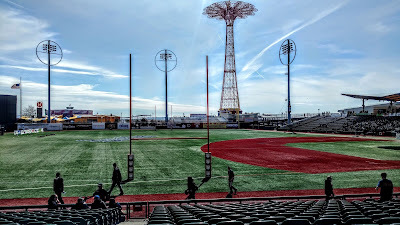 I visited this venue the season it opened and it wasn't 100% ready, so I did not comment much on the facility. Since then, there have been a few additions that merit a mention. Inside the main lobby there is a display of the four top athletes in Stony Brook history. Most recently, Jameel Warney played three games with the Mavericks and he is one of the four, along with Joe Nathan, Will Tye, and Lucy Van Dalen, who won a national championship in the mile back in 2012. 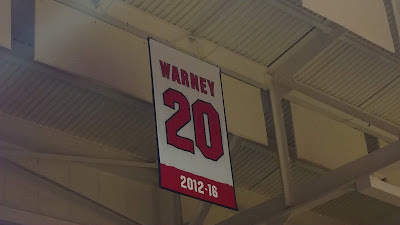 Warney has since been traded to the Knicks, so he might get some more time in the Association. Then again, if you didn't make the Knicks in 2018-19, your chances of making it anywhere are pretty low. As Eddie is a season-ticket holder for Seawolves basketball, he was able to pick up a couple of freebies at the box office. Getting there early, we were able to snag first row seats in the corner next to the Nets bench. The best seats were reserved for season-ticket holders I would guess, which is one of the reasons we moved to the corner. On the other side of the floor are the suites, which were obviously off-limits to us. Dale, the Nets mascot, brought a lot of energy to the evening; there he is below fist bumping the DJ, who was directly beneath us. Capacity here is 4,160 and there were over 2,700 in attendance, a good crowd given the location of the arena. There was a sense of anticipation in the air as the Nets were introduced; even at this level a title is meaningful. Both teams had recent draft picks on their roster, as well as some well-known college players. 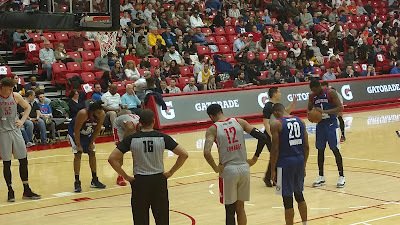 Isaiah Hartenstein, drafted 43rd overall by Houston in 2017, was the Vipers star, supported by Gary Payton II, while Long Island boasted Džanan Musa, the 29th pick in 2018, along with Theo Pinson, who was the starting point guard on the North Carolina Tar Heels 2017 championship team. Roy Williams was even in attendance to see his former player; that is Williams in the Carolina Blue sweater sitting courtside below. The game a typical G League affair, which resembles playground basketball with officials. RGV scored the first 5 points and never looked back, using some sharp three-point shooting to take a 38-24 lead after the first quarter. A 24-6 run to start the second gave them a 62-30 lead and pretty much ended the suspense. 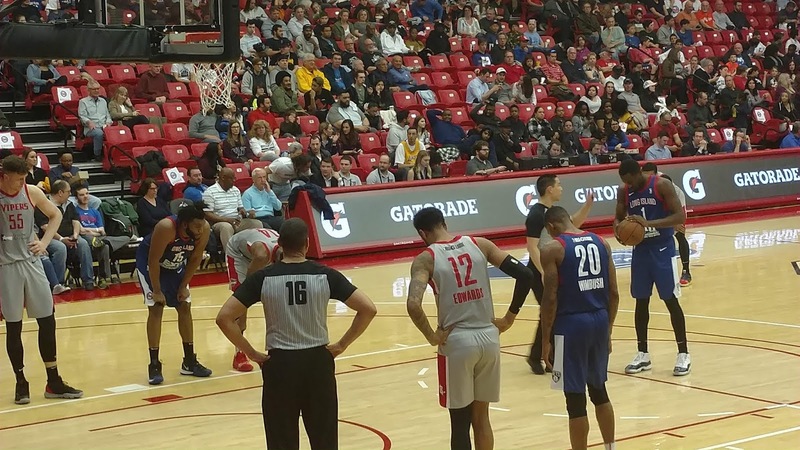 The Rockets are known for promoting three-point shooting and their affiliate has always used that as their primary weapon. When the team shoots well, it is hard to beat, and that was the case on this night. The Vipers shot 16/38 (42%) from outside the arc, while the Nets were a horrid 7/42 (17%). That was the difference as the Vipers glided to a 129-112 win. This was the third title in franchise history, but those wins have yet to translate to the NBA crown in Houston. I have now seen "second-tier" championships in all 5 major sports: AAA baseball, AHL, NASL, CFL, and G League. Before the game, Eddie and I checked out the first half of the women's lacrosse game between Stony Brook and Albany, played at LaValle Stadium. 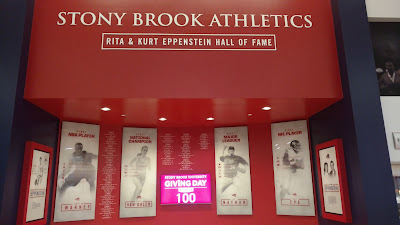 Stony Brook led 10-7 at the break but the action wasn't very compelling, so we left, thus this doesn't count as a venue visit. 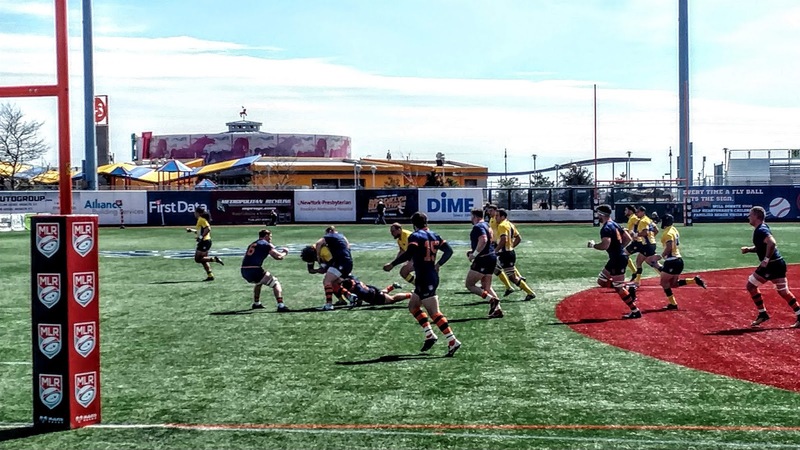 The Seawolves held on for a 17-9 win. Pinson was activated by the Nets and was on their bench the next day in Philadelphia as the Nets opened their series with a road win. Off to Oakland next weekend for the Blue Jays as my Toronto on the Road quest continues. Check back next week for a recap. The NHL playoffs begin tomorrow and Tampa Bay is the clear championship favourite after their dominant season. But they are not going to win, at least based on a trend I have noticed over the past several years. Every year at this time, I simulate the playoffs based on season series, and every time the simulation winner does not follow through by taking the Cup. Let's see how the season series play out. * For season series that are tied, the first tiebreaker is regulation and overtime wins (ROW), then goal differential. Pittsburgh and the Islanders each won one game in regulation and one in a shootout, so it comes down to goal differential, which the Penguins took 12-11. Similarly, Calgary outscored Vegas 14-9 in their 4 games that were split with 2 wins apiece. Meanwhile, Nashville and Dallas each finished with 6 points in their season series, but Nashville had 3 ROW to 2 for Dallas. So based on the season series/goal differential method, Tampa Bay would win the Cup. Which means that they won't because this method is always wrong. So who will win? I'm picking Nashville for two reasons: 1) they beat Tampa Bay twice; 2) they were the predicted winner last year and the predicted winner two seasons ago was Washington, who won the Cup last year. FYI, St. Louis was the only other Western Conference playoff team to beat Tampa Bay twice. After adding North Dakota to my list of states in which to see a game, I drove back to Minnesota, hoping to hit a doubleheader on Saturday. The Golden Gophers had a baseball game that would have allowed me to see a new venue, but that was postponed due to cold weather. Yep, it was around freezing in Minneapolis as March was decidedly not going out like a lamb. I had not prepared for the sudden drop in temperature, so even though the Twins were also hosting the Indians in an afternoon tilt, I had no desire to freeze for the afternoon. I watched from the comfort of my hotel room and the slow pace of the game (3 runs and 6 hits in exactly 3 hours) convinced me that I made the right decision. Fortunately, I did have an evening game to console myself, namely an NBA battle between playoff-bound Philadelphia and the Timberwolves. 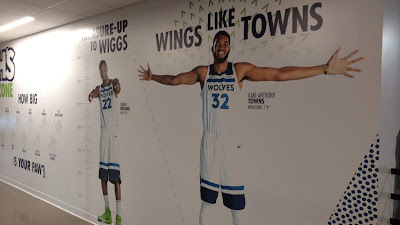 I visited the Target Center all the way back in 2010 when the blog was in its infancy, but things have changed there quite a bit in the meantime, so I'll include a few pictures of the features that are either new or that I missed on my previous visit. 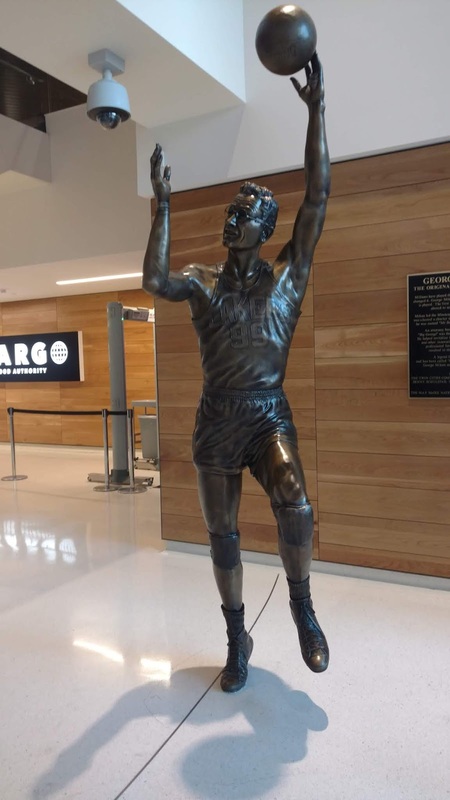 Just inside the entrance at the corner of 1st Avenue and 6th Street is a statue of George Mikan, who played for the Minneapolis Lakers between 1947-56 and whose influence on the game of basketball cannot be overstated. The statue was installed in 2005 after Mikan passed away at age 80 and I completely missed it on my first go-around. 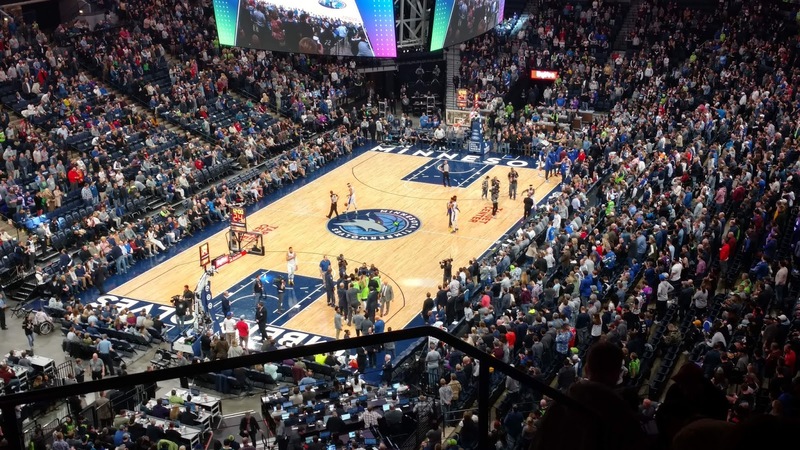 The Target Center is uniquely designed among Big 4 venues and has several small staircases and escalators that take you from the entrance level to the main concourse. 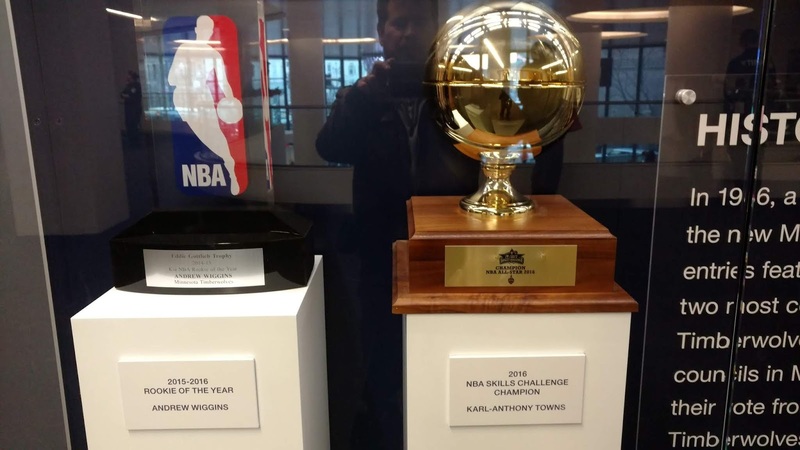 There you will find a display case with a few trophies, including Andrew Wiggins' Rookie of the Year from 2015 and Karl Anthony-Towns' win at the Skills Challenge in 2016. 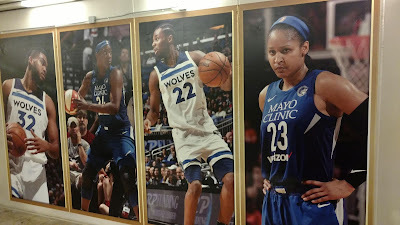 The Wolves have yet to win anything important, but their WNBA counterparts, the Lynx, took home four titles in seven seasons. In an interior stairway, I found a picture that predicts the future of NBA uniforms. Right now, the NBA allows a small sponsor patch near the shoulder strap, while the WNBA has gone the way of European soccer, with the team logo on the small patch and the sponsors taking up the prime real estate above and below the numbers. 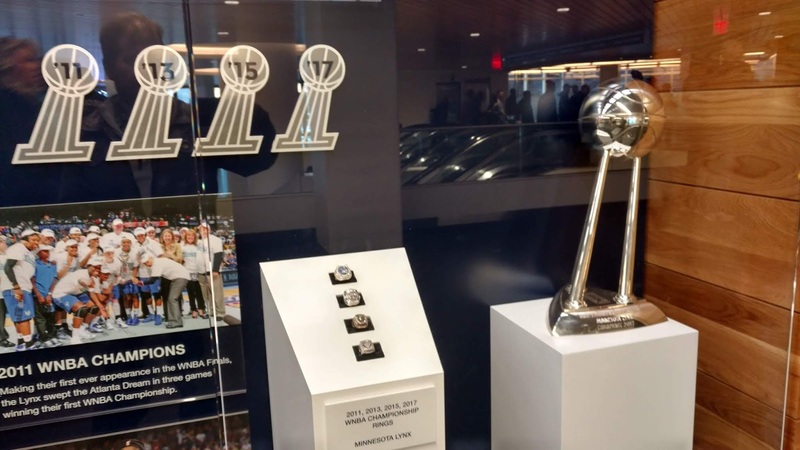 It won't be long till the bean counters in the NBA head office decide to do the same. Both Wiggins and Towns are on another display that lets kids see just how small they are in comparison. The banners have increased for both good reasons and bad. The late Flip Saunders is honoured as well as those Lakers teams that were so good back in the 1950s, along the Lynx. 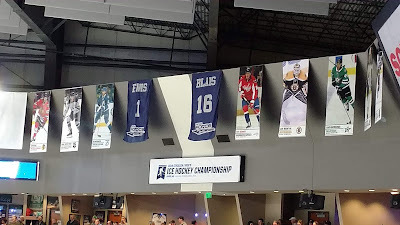 When I was here before, the only banners were for Malik Sealy and a Midwest Division Championship, which would look silly next to the four titles held by the Lynx. The concourse is spacious, though ceilings are very low in places. 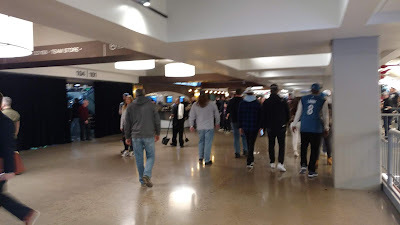 I had no trouble making my way around before the game or at intermission. 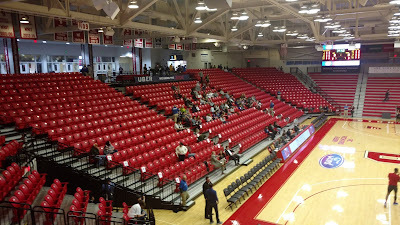 The lower bowl is fairly typical for basketball arenas, with a gradual incline as you make your way up. At the far end is a bar area which seems to be open to the public and allows for good views while standing if you get there early enough. Generally these areas are for socializing and attract fans who couldn't care less about the game; usually they are farther away from the court however. 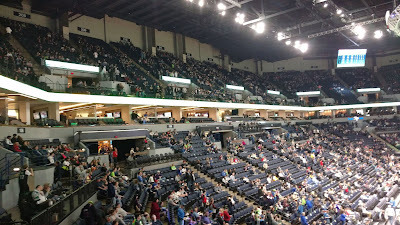 There is only one level of suites, so the upper deck is relatively close to the floor, at least in the lower rows. Note how much steeper it is than the lower bowl. The shot below is from my seat in Row J of Section 238, just above the railing. This is a mildly annoying place to sit as your view is blocked when idiot fans come up or down while the game is on. It's not like basketball doesn't have hundreds of timeouts per game during which you could go get your tenth beer. Fortunately, the lower level has small standing tables above the seating bowl along both sidelines, so I moved down at halftime to get a better view. I had to walk around a bit to find an open spot that was not patrolled by an usher, but once I did, I stayed for the rest of the game without hassle. 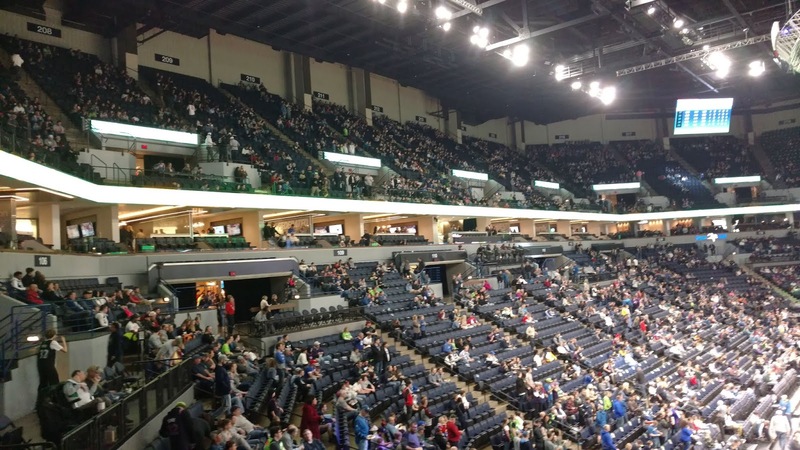 More venues should have standing areas for fans that actually want to watch the game, not these new social spots for fans who only want to take a selfie. Overall, the Target Center is a surprisingly nice arena for being nearly 30 years old. When I first visited, I didn't really appreciate what this place has to offer, and I'm glad I got a chance to come back. 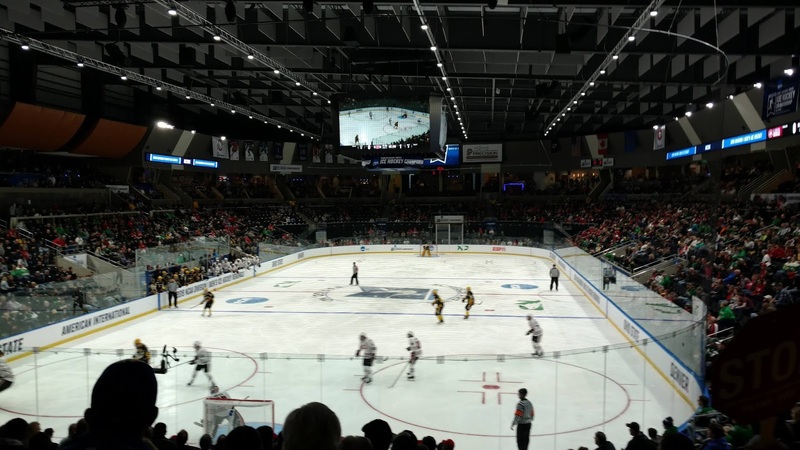 Sports venues evolve with the teams they house and a revisit every few years or so is the best way to see the changes. That's one reason that sports road tripping never gets old. 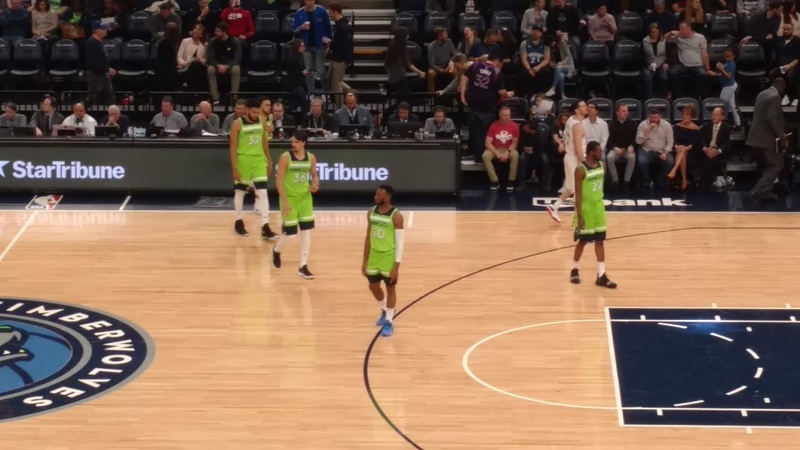 This interconference affair was billed as the return of Jimmy Butler, who was traded from Minnesota early in the season amid a lot of bitterness. Fans here were quite upset despite the fact that Butler only played one full season here and he was booed every time he touched the ball. The Wolves were wearing their garish Statement uniforms (the statement being that we can sell anything to gullible fans) to mark the occasion. The only team making a statement on the court was the 76ers, who ended the first quarter on a 12-0 run to take a 38-20 lead despite resting Joel Embiid. 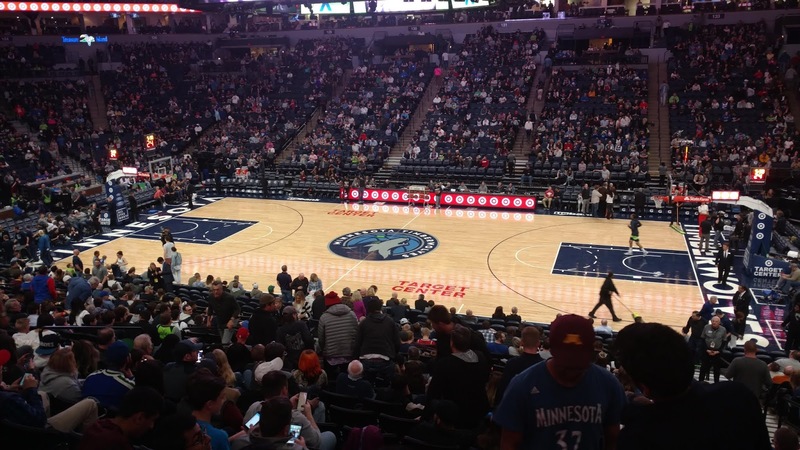 To be fair, Minnesota had defeated Golden State in overtime the night before, so it wasn't surprising that they were not fully prepared for this one. 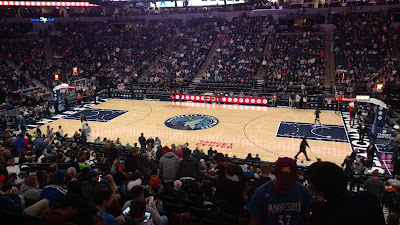 Still, the Timberwolves chipped away at the advantage and eventually got to within 3 midway through the final frame. 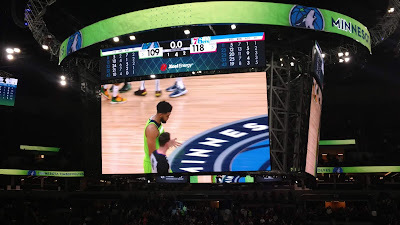 But they couldn't get that key stop that would allow them to tie the game, as Philadelphia managed to sink key buckets whenever Minnesota got close. The Wolves were forced to foul down the stretch and Philly had no problem making their free throws as they won 118-109 in a gift from the NBA schedule maker. I was particularly impressed by 76er Jonah Bolden, son of Bruce, who was born in Australia and played college ball at UCLA. He subbed for the resting Embiid and scored 19 points, including 5 treys, and finished +22. I think the 76ers are the best bet for the finals in the East, given what we know about the NBA (big markets matter). Milwaukee might be a better team, but they rely too much on Giannis, who seems to be suffering from knee problems late in the season. Of course, Toronto is also a top team, but regular readers know that there is no chance the NBA will allow them to make the finals. So expect Philly to be taking on the Warriors come June. 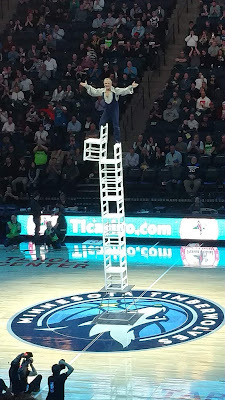 The halftime show was the Amazing Sladek, who is known for balancing on a stack of chairs. He is no spring chicken, billing himself as the oldest daredevil acrobat hand balancer, begging the question: how many daredevil acrobat hand balancers are there? Regardless, it is a fascinating show as the element of danger is always present. Several fans around me could not watch, but Sladek pulled it off. 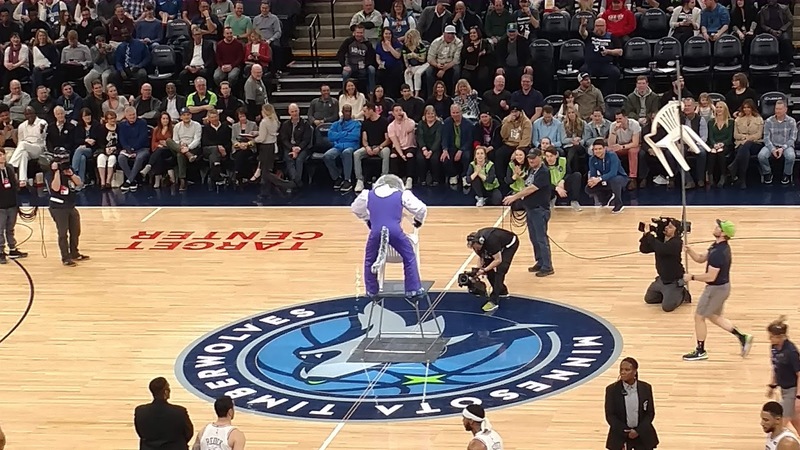 Later, the Timberwolves mascot, Crunch, attempted to replicate the act with two plastic patio chairs. I usually don't care much for the "entertainment" outside the game, but this was very amusing. Baseball is back and although I am no longer a fan of the game the way it is played these days, I still want to see the Blue Jays on the road in every stadium. I'll be heading to Oakland in a couple of weeks for that series, so check back then to see if they could muster a win, or even a run. I have two states left in which to see a game: Alaska and North Dakota. The former is being saved for an extended west coast trip sometime in 2021-22 when Seattle joins the NHL, while I was planning on visiting the latter this summer between CFL games in Winnipeg and Saskatchewan. That would be a five-day trip, the length of which would necessitate bringing along my family. When I mentioned it to my wife, she gave me a look that implied that she would not be spending one day of her precious vacation in that area, never mind five. 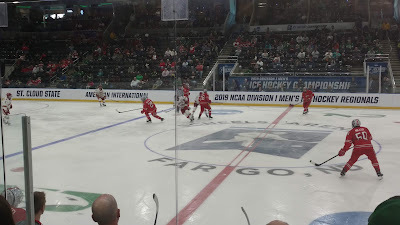 So I switched gears and looked for something that I could see on a weekend, and found the NCAA Hockey West Regional would be in Fargo the final weekend in March. 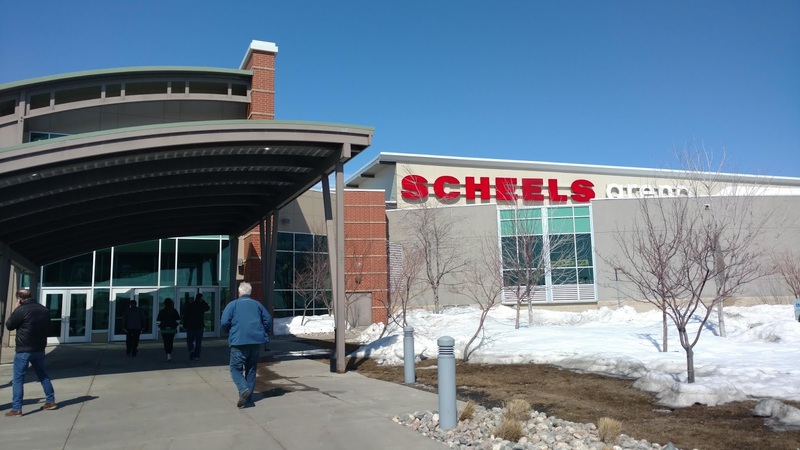 Flights to Fargo are not cheap, but they are to Minneapolis, which is about 3.5 hours away. 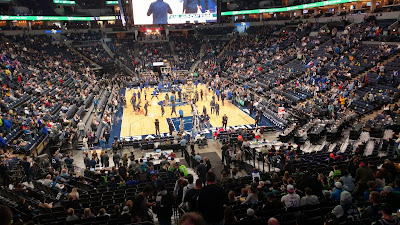 With the Twins opening that weekend and the Timberwolves hosting a couple of games, I had all I needed to make the trip. Of the 60 schools that play Division I hockey, 16 make the annual showdown, with four regions hosting 3 games over two days. 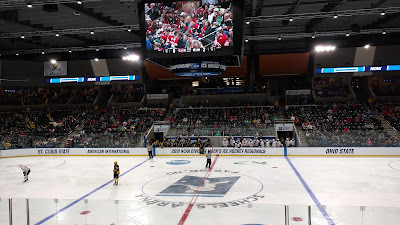 The West Regional started on Friday, and as I wanted to see the two games, I flew to MSP early that morning, landing at 10 a.m. local time. 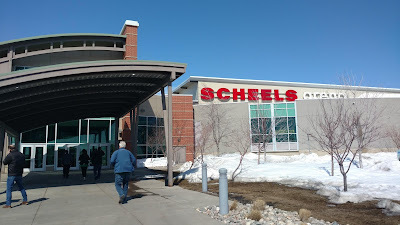 It is about 250 miles from the airport to Scheels Arena, where the tournament was being held, and after renting a car and making a brief stop at my hotel halfway between, I arrived at the rink at 2:15, 45 minutes before the first game was scheduled to start. Parking was $10 but I found a spot on the street and moseyed on over to the front of the building. 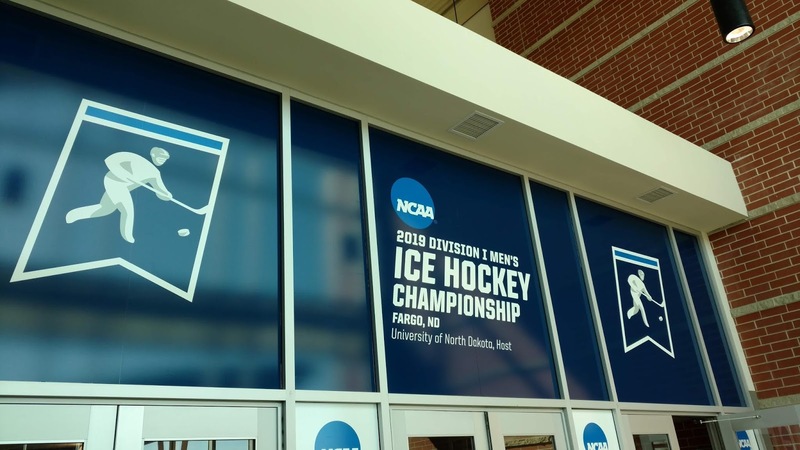 The regional was being hosted by the University of North Dakota, which is based in Grand Forks, just over an hour north of Fargo. 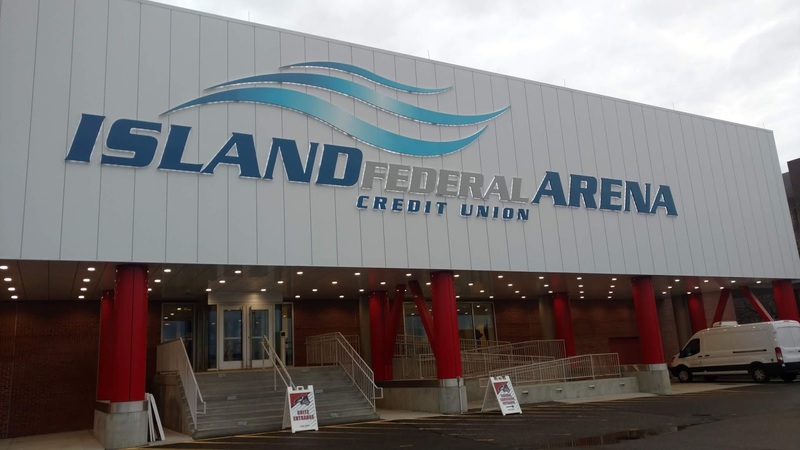 A lot of fans bought tickets in the expectation that UND would make the tournament, but they lost their first conference tournament game and were not selected for the national stage. This was good news for me, as I was able to pick up a center ice ticket for $20, less than half of face value. 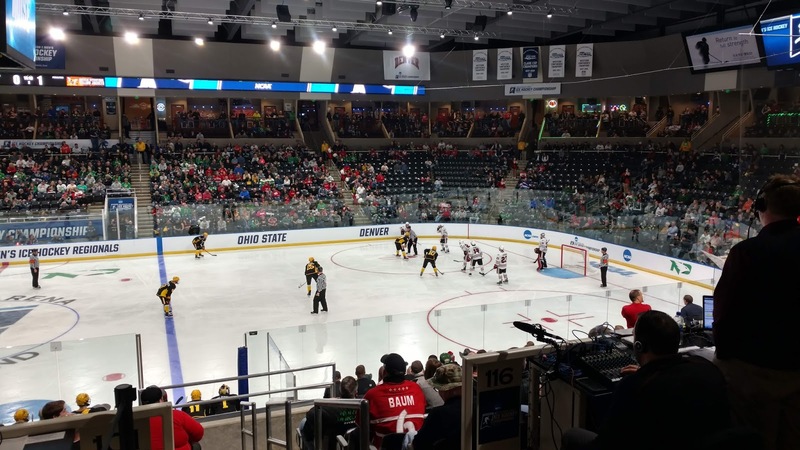 As you can see, there was not much of a crowd for the first game between #6 Denver Pioneers and #9 Ohio State. 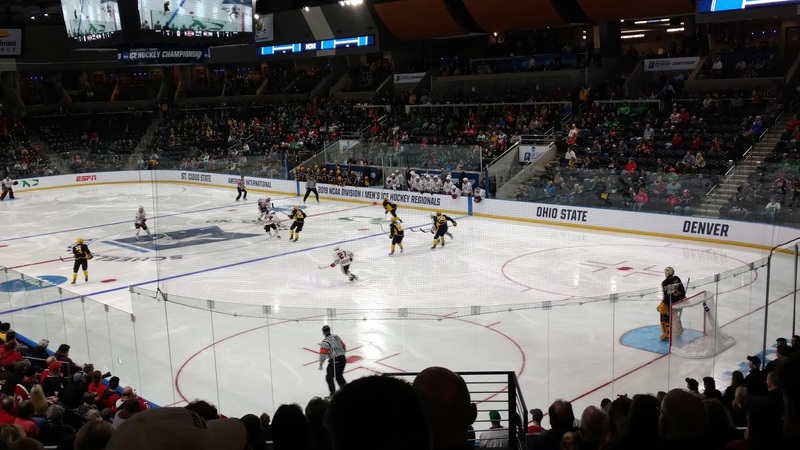 There were fans from both schools, and a few neutrals, but mostly empty seats at face-off. College hockey just doesn't rate highly, for reasons that became apparent as the evening progressed. Still, I was very excited to be there, and particularly happy with my seat, which was right behind the benches. Unlike rinks in the pros, where the coaches block your view if you happen to be in the first row, these benches are set below the seating area so that all fans get a clear view of the action. With little time to spare before puck drop, I didn't bother touring other than to look at food options, as I hadn't eaten since leaving home 9 hours earlier. Two hot dogs were enough to tide me over as I watched a very dull hockey game for the next couple of hours. It reminded me of those trap days in the mid-90s, with few chances and lots of defensive play. Ohio State was clearly faster and seemed to be the better team despite the rankings, but Pioneer goalie Filip Larsson (drafted by Detroit in the 6th round in 2016) was equal to any Buckeye blast. Still scoreless late in the second, Denver's Les Lancaster was left open coming down the right wing and beat Tommy Nappier with a shot that should have been stopped. That was all that Denver needed, as they shut down the Ohio State attack in the third, yielding just 5 shots. With a minute to go, Colin Staub scored into the empty net with Denver's first shot of the period to clinch the 2-0 win and send the Pioneers to the final. OSU dominated the face-off circle 37-14 and outshot Denver 24-13, but lost where it counted. With an hour between games, I had time to wander the arena, which is the home of the Fargo Force of the USHL. This is the top junior league in the country with 17 teams scattered around the midwest, and many players do go on to the NHL. Above you can see several are highlighted with banners, including Nate Schmidt of Vegas. 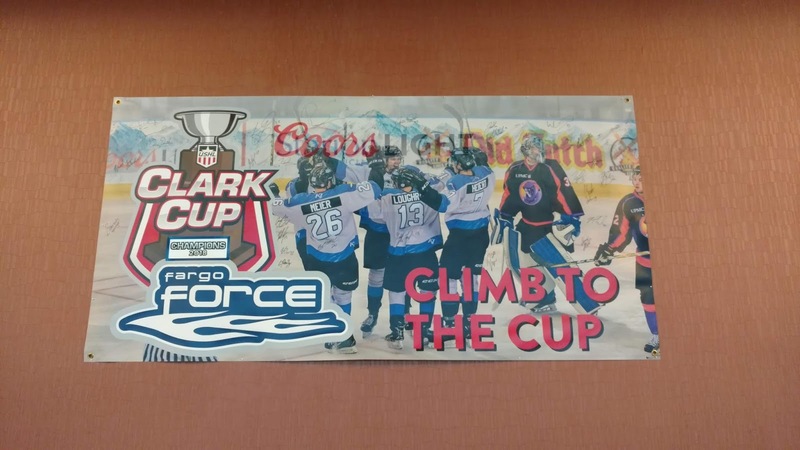 The team is also the defending champions, an accomplishment that was noted with a banner as well as a poster in the concourse. 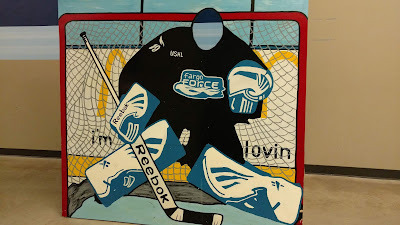 A goalie cutout was very popular with the kids, as were the bubble hockey games that should be mandatory in every arena. 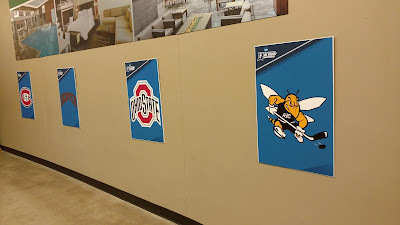 Of course, we were all there for college hockey, and small posters of each team could be found on the concourse. 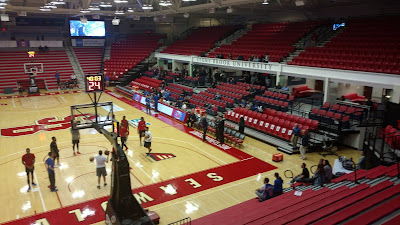 The photo below is from the side opposite of where I was sitting, which gives you an idea of how the seats are above the benches. This is a very nice arena and got me thinking about doing a USHL road trip sometime. 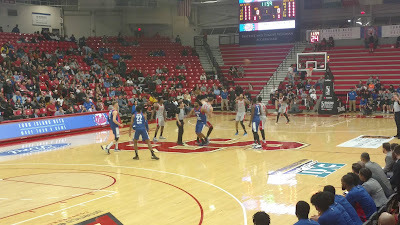 The second game featured #1 overall seed St. 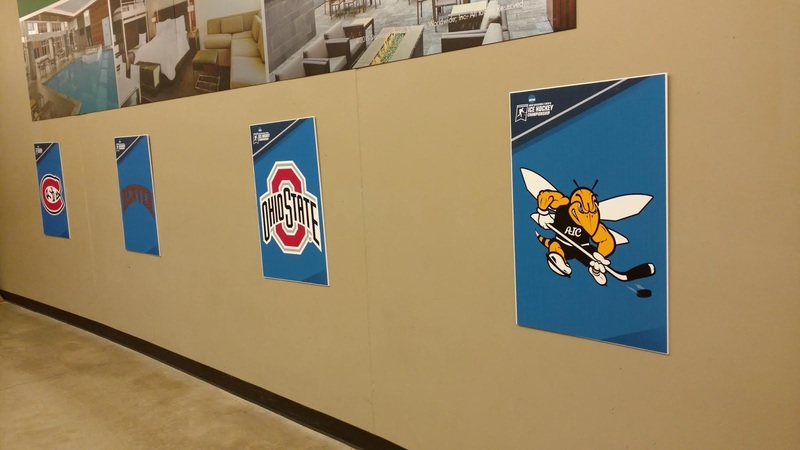 Cloud State Huskies taking on American International Yellow Jackets. Rather than return to my seat, I decided to stand in the general admission section behind one of the nets, visible in the photo below. Montreal's first rounder from 2017 Ryan Poehling plays for the Huskies (whose logo resembles that of Les Habitants), the highest draft pick among the four teams. I spent the first period by the glass and really enjoyed the view from that angle. 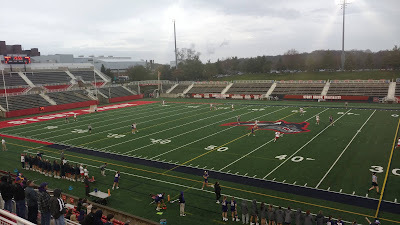 Unfortunately, my crap Motorola phone died, so I didn't get to take any pictures, but the game was similar to the first, with AIC (with not a single draft pick) stifling the more talented Huskies at every turn. 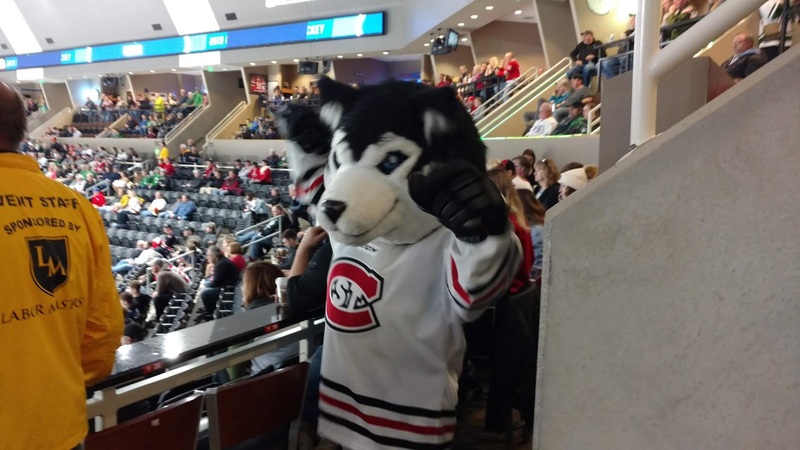 SCSU had lost as the #1 overall seed the year before, and were hoping to avoid a similar outcome, but an early goal by AIC's Joel Kocur (nephew of Joey) as he jammed one by David Hrenak (5th round by L.A. in 2018) set them on their heels. 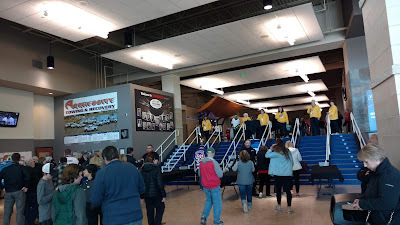 During the intermission, I was able to charge my phone, and spent the early part of the second period wandering around taking pictures from different angles. At one point, I saw the St. 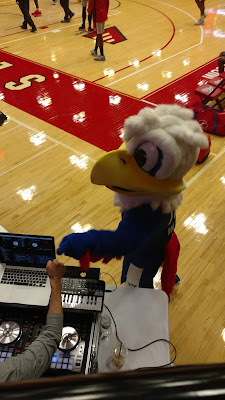 Cloud State mascot Blizzard and snapped a shot of him. Five seconds later, AIC scored when Hrenak let a weak shot slip through and I realized that I had jinxed the Huskies. Or maybe not, as a fan had mentioned the Hrenak lets in a bad goal every game, and this was certainly one of them. Either way, with a two-hour drive back to the hotel and my energy waning, I decided to avoid any retribution by Blizzard and headed out, snapping one final picture from behind the St. Cloud goal. 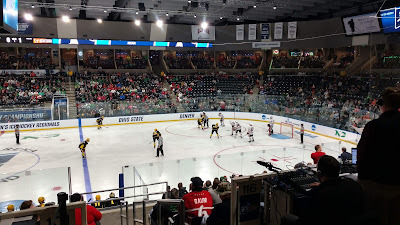 The Huskies did score on the power play midway through the final period but could not find the equalizer despite a flurry of late chances (I watched the final period a couple of days later). AIC won 2-1 despite being outshot 34-13. Both games were similar in that the weaker team used a stifling defensive approach and won on a goal that should have been stopped. Denver beat AIC 3-0 in the final on Saturday to reach the Frozen Four, which is being held next week in Buffalo. 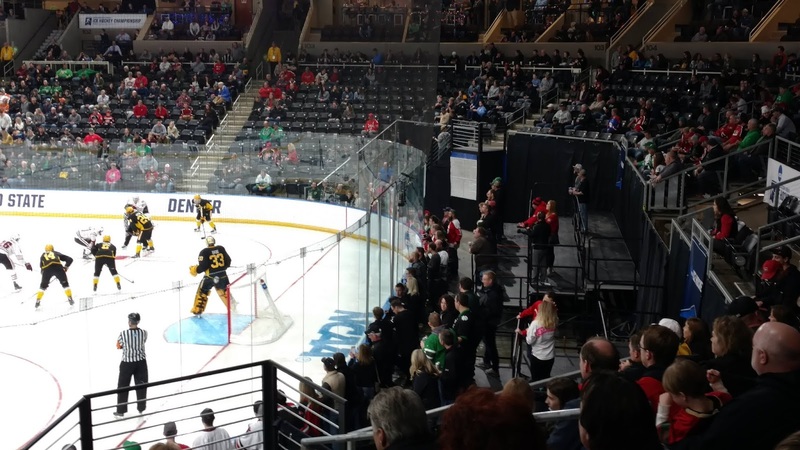 With his team eliminated, Poehling reported to Montreal and played in his first NHL game on the final day of the season against Toronto, scoring a hat trick and the winning goal in the shootout. Guess the Leafs should have been scouting that game to see how to shut him down. 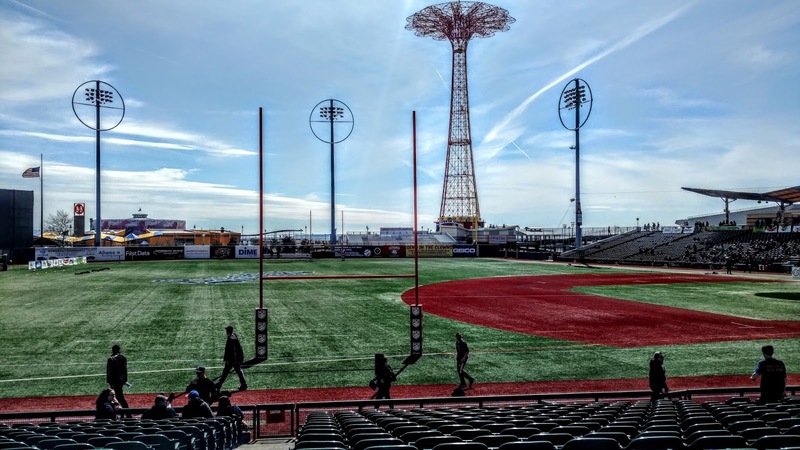 Major League Rugby (MLR) is the newest addition to the sports scene in New York City, with expansion team Rugby United New York (RUNY) taking the field for the 2019 season. 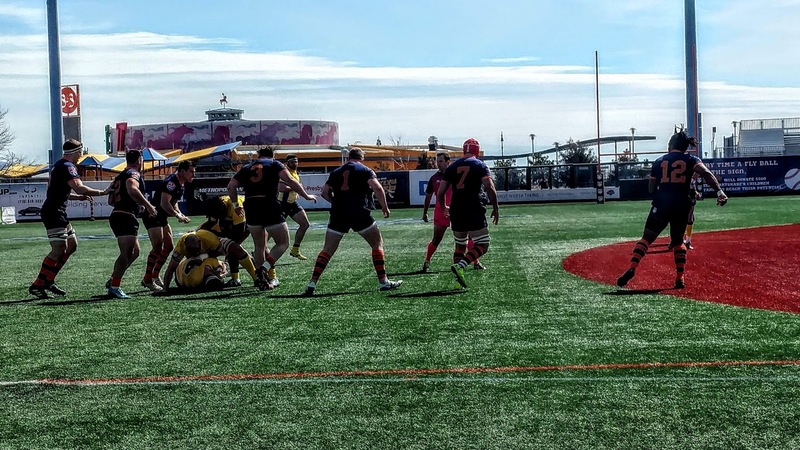 The league began play in 2018 with seven teams, and the Toronto Arrows joined RUNY as expansion clubs this year. 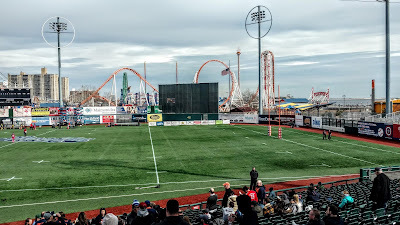 Even though it is called Major League Rugby, they play rugby union, a different sport than rugby league. It is also not quite major league yet, but that is what they are working toward. Teams play 16 games in a home-and-away round robin over 19 weeks, with the top 4 making the playoffs. 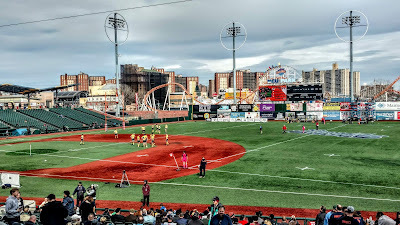 RUNY (pronounced Rooney, as in soccer star Wayne) plays out of MCU Park in Brooklyn, summer home of the Brooklyn Cyclones. 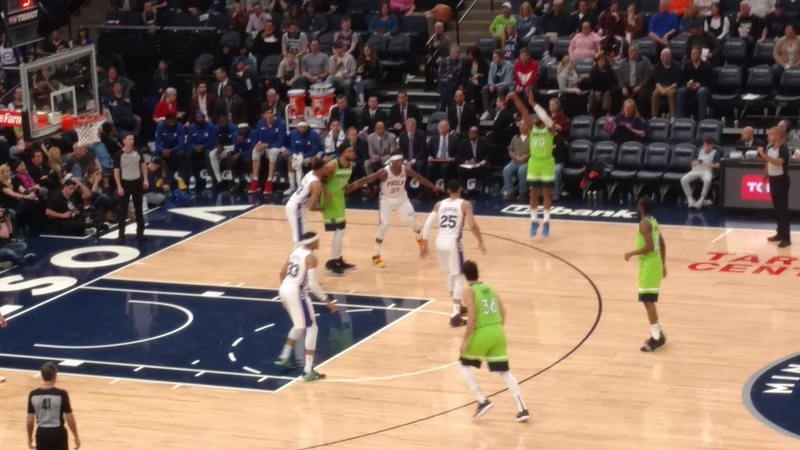 After a five-game road trip to start the season (the first week of play was in late January), the team played Toronto to open their home slate on March 15. I was in Winnipeg that day so missed the match that saw RUNY score a last second try to win. Their second tilt was on Sunday against last season's runners-up, the Glendale (Colorado) Raptors. 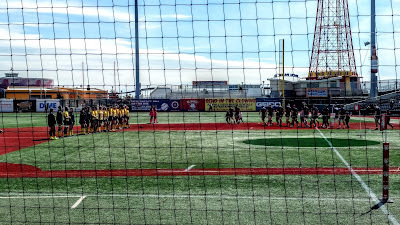 With fine weather and nothing else to do, I headed over to Coney Island to see my first MLR match. I arrived about 10 minutes before the scheduled start time of 2 p.m. and picked up a ticket for $20 from the box office. No need to pay more here as you can sit where you want. When I walked in, I saw that they had just painted some lines on the field and added the goalposts, without even covering the diamond. 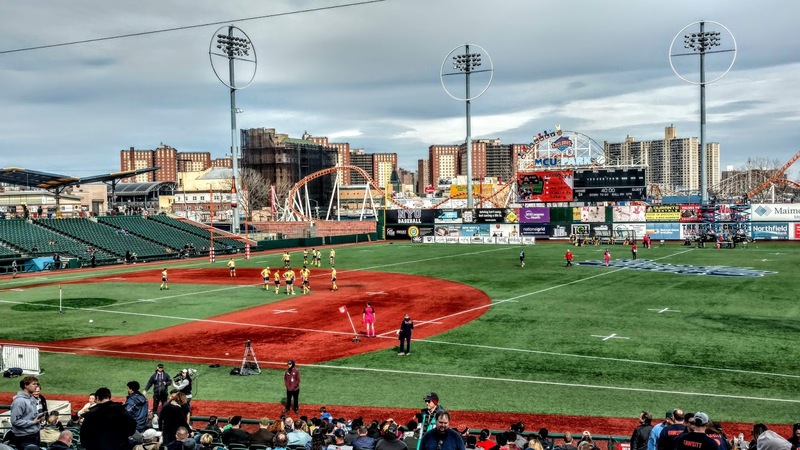 As the playing field is artificial turf, it will likely remain that way. It was a bit disconcerting at first, but once the action starts, you don't really notice it. 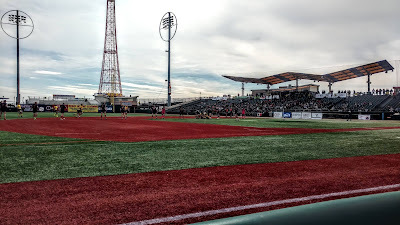 Most fans sat along first base, or midfield in this case. The view from the concourse is above and below. There were a couple of concession stands open and doing brisk business. Alcohol sales cease at the 65th minute, the least-liked minute in sports according to the P.A. guy. There was little lead-up to the players emerging from the dressing rooms. The teams were announced, walked out to midfield, faced the crowd, and then turned to face the flag for the national anthem. With the formalities over, the match kicked off at 2:07. I preferred to sit behind one goal line, which led to great views when the action was in that end. As the field is quite far from the sideline seats, this is a better area to sit if you want to get close. 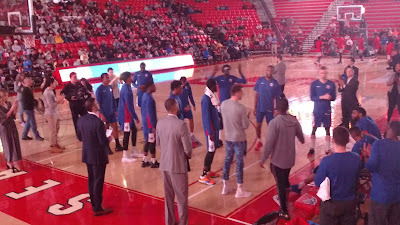 The players are mostly Americans with several of them members of the national team. A few lower-tier players from overseas complete the squad; the only name that might be recognized for RUNY is Ben Foden, who played for England a while back, and is now in the news after separating from his apparently famous wife. The match saw RUNY score four tries in the first half to Glendale's one as they went to the break up 24-7, having missed two conversions. The tries were actually quite exciting, with some long runs and good passing leading to the scores. In particular, New York's third try saw them go the length of the field after a Glendale drop near the try line. However, the rest of the play saw a lot of penalties and unforced errors, particularly from the visitors. Near the end of the first half, RUNY's James Denise was sent to the sin bin for 10 minutes, and the Raptors capitalized early in the second half to get within 24-12. But the RUNY defense held for the rest of the time, and when they scored a fifth try, that pretty much sealed the deal. A late try for Glendale made the final 31-19 as RUNY moved to second place in the table with a 6-1 record. If I find highlights, I'll post them here. Overall, the match was mostly entertaining, but there were several times where action was halted. There are hydration breaks midway through each half, and the usual breaks to set up scrums and for the occasional injury. The game still moves quickly, taking less than two hours and I did enjoy the experience. Attendance was announced at 2,703 but I think there were perhaps half that number at the venue. Rugby does have a small but passionate fan base here, and it will take time to see if they can make new fans. The team is doing well, and as weather improves, they should see an uptick in attendance. A bit of advertising would help, so I'll do my part here. If you live in NYC, go check out a RUNY match!